This was my first attempt at cheesecake. Usually I prefer cake, but I also get into pie around the holidays. But for some reason, trying to bake a cheesecake intrigued me. There is a volume of commentary out on the internet that describes the daunting process of baking a cheesecake, which made me nervous to even attempt it. But after perusing through numerous food blogs, I gathered that the real key to baking a cheesecake was the water bath (which is not exactly a difficult step in the process), particularly if you are concerned with cracks in the cheesecake. Otherwise, I found the assembly to be (way too) easy. Admittedly, I encountered some problems, mostly related to naivety but also to the finicky temperature control (or lack thereof) of my gas oven. The hardest part is determining when the cheesecake is finished baking, especially when the bake time exceeds that of the recipe. Alas, all oven temperatures are different (hence the reason for the wide range of baking time included in the recipe), so its best to keep an eye on the cheesecake during the baking process. The “expertise” of baking a cheesecake turns out to be nothing more than using a water bath and trusting yourself enough to gauge the appropriate done-ness. I didn’t remove the springform pan until minutes before serving, mostly out of fear, and was surprised by how beautiful it looked. I really liked this cheesecake. The filling was great, the crust was phenomenal, and the raspberry topping was both delicious and aesthetically-pleasing. Based on recipes found here and here. I used this springform pan, purchased from Bed, Bath & Beyond. For the crust: Use Cuisinart food processor to blend cookies into fine crumbs. Melt butter and, in separate bowl, mix well into the crumbs with sugar. Pour the buttered, sugary crumbs into the springform pan, and firmly press the crumbs into the bottom of the pan (don’t go up the sides, it’s easier). Cover and refrigerate until cheesecake is ready. For the cheesecake: In Cuisinart food processor (preferably washed for cleanest, smoothest cheesecake), beat softened cream cheese and eggs until smooth (2-3 minutes). Add in powdered sugar, granulated sugar, vanilla, and almond flavoring (if using), and mix until incorporated and there are no lumps. Bake for 60-90 minutes or until the top of the cheesecake begins to turn light brown. The sides will likely appear cooked, but the center of cheesecake will likely still be jiggly and will continue to cook/settle as the cheesecake cools out of the oven. Cool thoroughly in the springform pan. For the topping: Puree raspberries in a blender and pour through a mesh sieve a few times to remove as many of the seeds as you possibly can. This should make about 1 cup of raspberry puree, which you can measure if you’d like (don’t think adding more raspberry puree will ruin the cheesecake). Whisk raspberry puree, sugar and cornstarch in a small saucepan until blended, bringing mixture to a boil over medium-high heat and cook, stirring constantly, 1-2 minutes or until slightly thickened. Remove from heat and let cool. 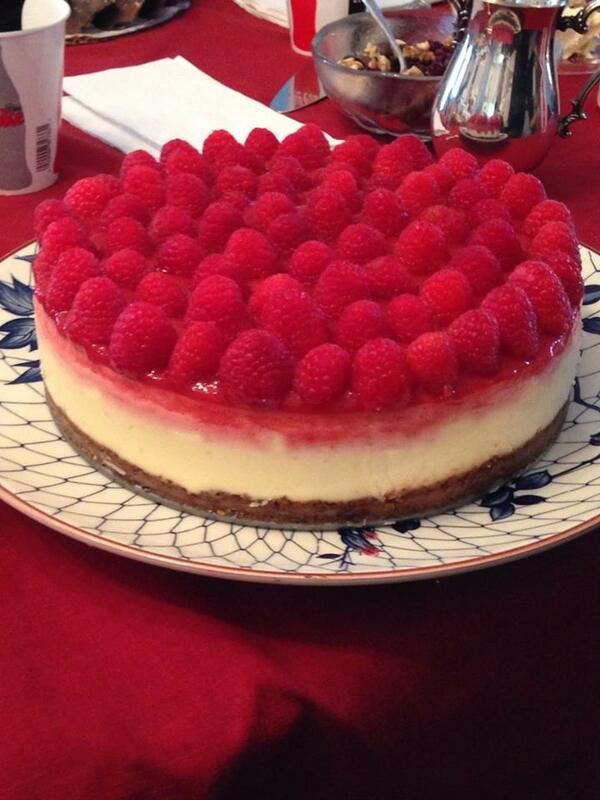 Spread cooled raspberry topping evenly over chilled cheesecake (may need to heat puree slightly to loosen it up). Top with remaining raspberries and chill for at least an hour before serving.